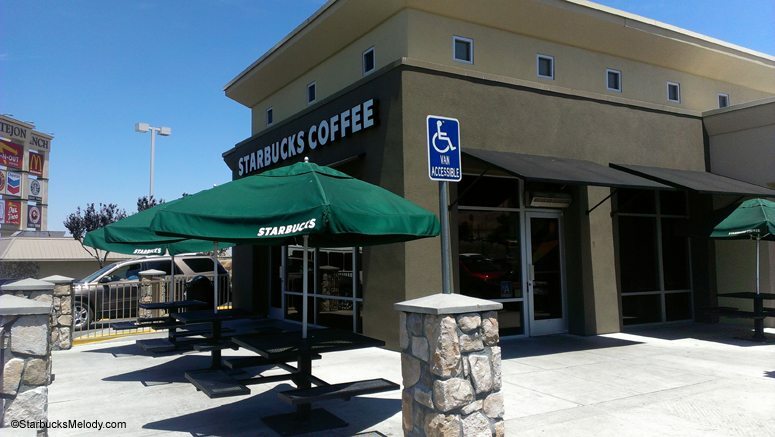 You might be surprised to learn that this isolated, small, Starbucks in the Central Valley desert of California (Lebec, California) is one of the very busiest stores in the entire company. It competes with the New York City Times Square Starbucks and 1912 Pike Place store, vying for the top position, and holds strong in the top five in the United States. That is amazing! New York Times Square Starbucks and 1912 Pike Place Starbucks are often #1 and #2 for sales volume in the entire Starbucks corporation, with six million in annual AUV and five and a half million, respectively, as per Troy Alstead during an investor event (more info below). As it happened, I knew that would be driving right past this store, on a road trip from Southern California to Seattle, in late June. I dropped by this store on June 28, 2013. By the way, this isn’t really a store that you decide on a whim to “drop by.” Not at all. If you’re coming from Southern California, you’ve driven on busy roads (for probably about two plus hours, with LA traffic), climbed 3,000 feet in elevation through the Angeles Forest (which somehow still a desert), and you’re dying of heat because you probably turned off your car’s AC during the six mile climb up 3,000 feet. Then you breeze a bit downhill, traveling a long distance of nothingness. It’s hot. 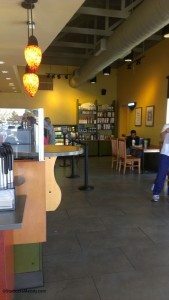 When you reach this Starbucks, it appears like an oasis, and you want it. Thank god there is a Starbucks. Needless to say, when I talked to the store’s manager, she mentioned that they have incredible bottled cold beverage sales. When I stepped out of my car, it was still a cool 94 degrees out because it only about the noon hour. My in-car nav seemed to think this Starbucks was closer to “Arvin,” California than “Lebec,” but the store is clearly listed as being in Lebec on the receipt and store locator. In the middle of nowhere, there’s this complex of drive-thrus including a Del Taco, In-n-Out Burger, McDonalds, this Starbucks, and several gas stations. It’s apparently the “Tejon Ranch” business complex. By the way, while visiting the Tejon Ranch area, I decided to stop into the In-n-Out Burger. It was so packed I could barely get in the door. Ultimately, I decided to use the drive-thru which took twelve minutes, but I think, somehow was faster than if I had gone inside. But I would have rather eaten my lunch in their air-conditioned location! I really wanted to visit this store partly because I figured that any store that it is in the top five of the entire company must have an amazing manager. Actually, if it didn’t, I would assume they’d have chaos. I met Margherita,who is a 9-year Starbucks partner. She proudly told me a little bit about her store – seems as though the drive-thru is never empty of cars! She said they do have a strong espresso bar business, but sell little merchandise. And, she sells a lot of cold, bottled beverages. I totally enjoyed meeting her. If you happen to be on a long drive on I-5, I recommend that you stop at this store. One thing that I would imagine would be odd about working in a store like this, is that you would have very few regulars! There you have it! I made it to one of the busiest Starbucks in the whole corporation. I ordered a Venti Iced Passion Tea. Gustavo took my order, and was a friendly young guy. And, I met an enthusiastic Starbucks manager. Two thumbs up for Lebec Starbucks! Interesting to see that it still has the old decor that some of our stores here are slowly losing. It’s amazing to think that this is one of the busiest in the company. I’ve been to the Times Square store and it literally never stops all day! @Chris – I thought the same thing – The store looked like it was in need of a major remodel – and still one of the busiest in the entire corporation. An amazing story! So cool to see that stores like this are among the busiest in the world. Would have never expected that. I can say I certainly would too have appreciated this SB along my car ride for sure. Seems like the partners are so friendly which is quite nice. Is this area building up as per the other fast food places? Just curious what is the next closest SB store to this one? @Purple1 – Good question. I think the closest Starbucks might be Bakersfield – that would be like about 40 miles away. Another possibility is that I think there might be a Starbucks in Gorman, California which would be only about 10 miles away. If you’re willing to driving the elevation through Angeles Forest, then you’d have a lot of Starbucks south, heading towards LA County – Santa Clarita. But that’s the problem – that is unpleasant driving. About 50 miles away, I think there’s a Starbucks in Buttonwillow, California too. What a neat little story! This is why I love reading your blog so much. As far as needing a remodel goes, they probably don’t have time to stop! Lol! I was wondering how your trip was at the March and I5 store in Stockton? My best friend manages that store and she called me immediately after you left to tell me she had just had an exciting experience. So now we have both follow your blog!! Hi Anne! It’s a small world! After visiting Lebec, my next stop was Stockton, at March & I5. I really had a bazillion stores I could have visited if you consider how many Starbucks aren’t too far from I5 between Orange County & Seattle. I picked the March & I5 Starbucks in Stockton because the store manager came so highly recommended via someone on Twitter whom I trust in the world of Starbucks. And, I’d heard the store had recently had a beautiful remodel. I walked in just as the SM was leaving. I had literally driven straight from Lebec to Stockton! I went running after her and said, “you can’t leave – I want to talk to you!” And lucky for me, she said “sure” and turned around and came right back inside the store. The store was so pretty. There was a gorgeous mural that was pretty unique – I have seen many stores, and sometimes I recognize the same wall designs as repeats. This mural featured Pike Place Market, with just lovely artistic imagery of the market itself, and 1912 Pike Place. The store looked great. The thing was, every seat was taken. When Jamie & I sat down to talk, I looked around and saw that I was never going to be able to get photos because there were just too many customers. I know that customers are in a public place, and I can’t ever get a store totally empty, but when a store is packed full, it doesn’t make for a good blog article because then you can’t see the lovely store design. I had a great time talking to Jamie. I LOVED her passion for community service. She showed me the certificates on the community board for the amazing things they’ve done in their store. It really was a wonderful meeting. But when it was done, I just left. I’ve been known to hang out in Starbucks stores for a long while waiting for the story to empty to take pics, but I really needed to get back on my drive. So I didn’t get enough to really put together a blog post. 🙁 I did genuinely think March & I5 was one of the great stores I visited on this trip. The guy who took my order at the register (the barista was wearing a name tag and his name began with the letter “Z” but I can’t recall it now) was so genuine. I ordered a tea or refresher – can’t even remember. He asked for my name for the cup, and then wrote a few letters, scratched through it, and asked again, “how was that spelled?” to make sure that Melody was spelled right on the cup. How totally awesome. Thinking of a desert Starbucks made me think of the one in Ritzville, WA about 90 miles west of Spokane on I-90. I don’t think the sales are like what you are talking about in this post. But I am wondering if Ritzville is the smallest town to have a corporate Starbucks? @Marsh – Interesting. I just did a google search of Ritzville, and it looks like it has a population of about 1,600. That’s amazingly small to have a Starbucks! I think Lebec is still a little bit smaller. 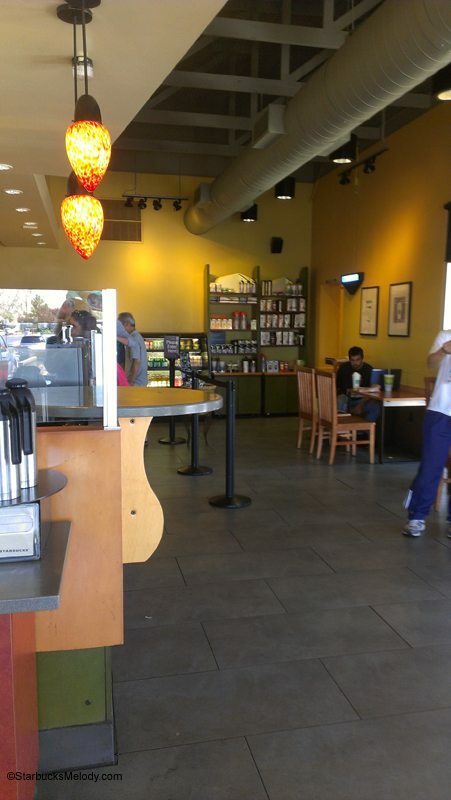 I am pretty sure that there is a Starbucks in Buttonwillow, California (also off of I-5 and gets major traffic from I-5) and Buttonwillow appears to have a population of around 1,500. ? Would love to know the smallest actual town to support a Starbucks – Ritzville, Lebec, and Buttonwillow have got to be close to the smallest out there. This store is in my area. The RD is notoriously out of touch with store operations (Even though an email she sent Howard is quoted in, “Onward.”) Though the store is scheduled for a remodel soon (They’ll be bringing in a “Starbucks Truck during the remodel), the partner experience at this store, and others in the area, could be so much better if there was more willingness to invest in efficiency improvements. The store manager here does an amazing job given the complexity of staffing such a high volume store in such a remote location. To answer the question, there are a few anamolous towns that have Starbucks. The City of Industry, CA (population 219) has three and San City, CA (population 334) has two (one free standing one and one in the local Target). For towns that are off the beaten path, in CA there are Starbucks in Taft and Coalinga, 60+ miles west off I-5 in places dominated by oil rigs and prisons. Out in your neck of the woods, Leavenworth, WA (population 1,965) has two (corporate and Safeway), although that is really a tourist trap fake German village – but it is so far out of the way from a major interstate. I have frequented that one many times on my quest to visit relatives in SoCal (I am in NorCal) and it is busy, busy, busy. And so is that darn In & Out! Lol. But when you wan them after traveling 3 hours, you just wait. And it seems these stores know their business because you believe you will wait forever and you don’t. I’ve slept next to this store many times!